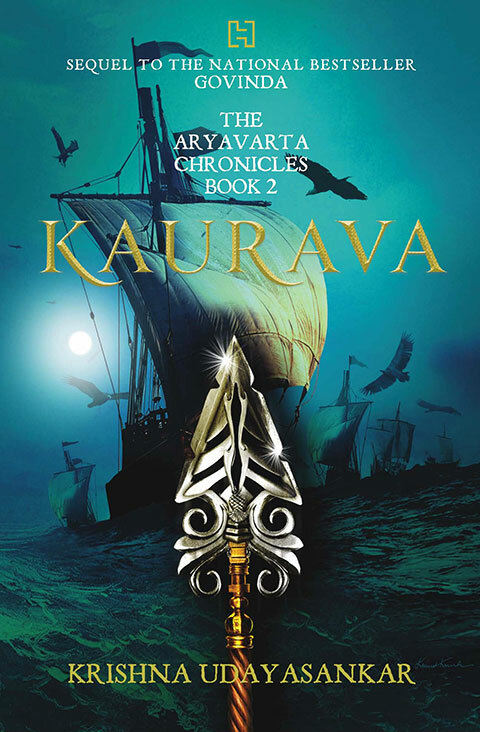 Krishna Udayasankar’s Kaurava, book two in the Aryavarta Chronicles trilogy, always ran the risk of being a dull addendum to the first part (Govinda); a sort of buffer zone between the curious beginnings of a first book and the exhilaration of tying up loose ends in a third. As is the case with so many trilogies, the second book risks becoming invisible and apologetic about itself with its stagnant plotlines and uninspired writing. There is an impatient, restless attitude of “just bear with me, we’ll get to the best book soon”. However, right from the dazzling book cover that announces its presence loudly, Udayasankar’s Kaurava is no apology. With its Tolkien-esque genealogy trees and maps that look like Middle-earth, Kaurava takes off from where Govinda left off. Dharma Yudhisthir and Panchali Draupadi are now married and rule over Aryavarta—all beautifully orchestrated in Govinda—but not without their issues. What follows is a predictable what-happened (the Pandavas gambling away their empire, followed by their exile) told with a refreshing how-and-why-it-may-have, as the war between the damned Firewrights and the noble Firstborns threatens to boil over. Even though the books are loosely based on the Mahabharata, for someone with no previous introduction to the series, the names of characters and places may be a little hard to follow. You won’t find names like Arjuna, Draupadi, Duryodhana, Krishna, etc. In fact, even with the list of characters on hand, it becomes necessary every now and then to stop reading and look up the list because you don’t quite remember who one of the characters is. This could totally make or break the series for you. If you’re not too patient with un-learning, you might find this infuriating. But for me, it was this series’ most redeeming authorial decision. The book demands an active participation, you have to pay attention and make sure you don’t lose your stride. Inside the universe of Aryavarta, the world building is detailed and well thought out. As an author, Udayasankar’s strength lies in demonstrating characters and ideas, not describing them in paragraph after droll paragraph. Panchali and Dhaumya’s interaction, which involves a lot of pontification on scriptures and philosophy, is one example of such. Of course, Udayasankar’s imagery might come across as trite to some, perhaps melodramatic even: “… a small, fragile whiteness against the mighty earthiness that was Aryavarta”, but I believe that this would generally be the case with the retelling of any epic. Conventionally, the Draupadi-Krishna relationship is culturally analysed through the prism of asexual, brother-sister love. Udayasankar’s Panchali and Govinda have an unrequited love which seemed to be the first calculated casualty in the mechanisms of power and play. Govinda’s nephew, Abhimanyu, projects his own worship of his uncle on the world: “In his mind, Govinda Shauri was incomparable”. This offers a glimpse into where mythmaking begins—with a very personal sense of awe and devotion. As with Govinda, the overwhelming subtext is that perhaps those who have come to be our most epic mythological stalwarts and gods once started out as (revolutionary and resilient perhaps, but) achingly human. Udayasankar is a reader’s writer. She’s accessible without being overbearing; her Twitter profile is a constant hum of interaction with her followers. The discerning restrain in Udayasankar’s language hammers in the fact that her approachability as a writer is not due to any anxiety to please the reader. In a market painfully saturated with mythological retellings, what separates Udayasankar’s Aryavarta Chronicles at the end of the day is her poise as a writer. Whatever the series’ true origins may be, the first two instalments of the Aryavarta Chronicles come across as very well-planned. It is like a friend who insists that it was no hassle at all to make you an elaborate lunch, and that he/she would have made it irrespective of your presence. So much of Govinda and (especially) Kaurava’s strength comes from exactly this thumping faith that you feel as a reader, that this is a story fated to blossom, whether under a rock or in wholesome sunlight.